I have struggled with my weight since I was 17 years old, leaving me on a constant up and down roller coaster, white knuckling diets then using food as my “good girl drug” to rebel against them and not to feel. There was a constant addition or subtraction on my scale of the problem that plagued me and my mind seemed to never experience rest from the never ending diet thinking and berating of my body. It was always an extreme of eating too much or eating too little and never really knowing what was best for me. And so the merry-go-round of dieting and emotional eating went on for years until I just couldn’t do it to myself any longer. 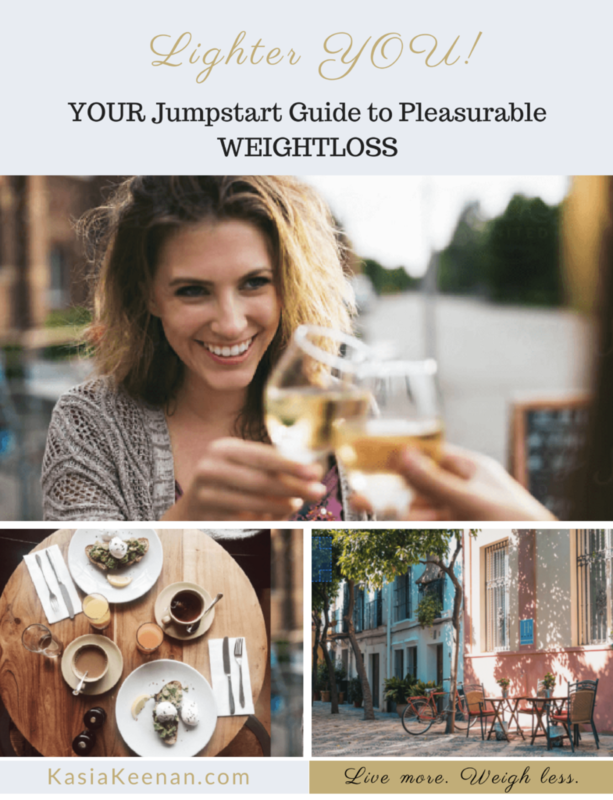 The journey towards ending dieting for good and really getting to the root of why I was overeating began when I traveled to Europe. Being originally from Poland, I would go back to visit my family, but as a French minor I would spend a lot of time in France. It was there that I fell in love with the French culture and their way of life because of what I observed from a distance. I saw beautiful women of all ages that seemed to really enjoy their lives through their relationships, great food and wine, as well as fashion that suited them individually for their body types. There was a true appreciation for themselves which showed up in the air of confidence they held, embracing all of themselves down to their imperfections. It’s in their enjoyment and appreciation of great quality that you saw them eating delicious foods and drinking great wines, and being able to stay at a natural body weight. They gave themselves permission to enjoy while their love and connection to their bodies allowed them to be able to stop when they were satisfied and not eat beyond full. I would return back to the States and wondered if I could have that here or would I have to move to France. This led me on an extensive study that dove into the human mind, habits, emotional eating, whole and processed foods, as well as the obsession with dieting in this country that has the largest overweight population. I then discovered and studied under several great Master Coach Teachers focusing on Weight loss and Life Coaching. Through all these years of in depth study and a combination of many different aspects of my extensive studies, I have seen this work on myself. I have been at my natural body weight for over 4 years and it’s been so freeing. This is why I am so excited and desire to give back to women like yourself who are tired of the weight roller coaster and desire to feel good in their minds and bodies. My program is not another diet, but really taking charge of your mind and thinking on purpose to create the kind of life you are meant to live and end your dieting stuggles for good this time. It is designed for smart women that take care of everyone and everything around them and are finally ready to take a step towards properly taking care of themselves in their minds and in their bodies. Think of working with me like a spa treatment for your mind and body of self care. This is a gift to be given to yourself of making peace in your mind and in your body to get back to your natural weight that is intended for you. I hope you’ll read all the free information here and sign up for my news letter and let that be a part of the gifts you give to yourself in incorporating some of my methods or perhaps all of them for yourself.